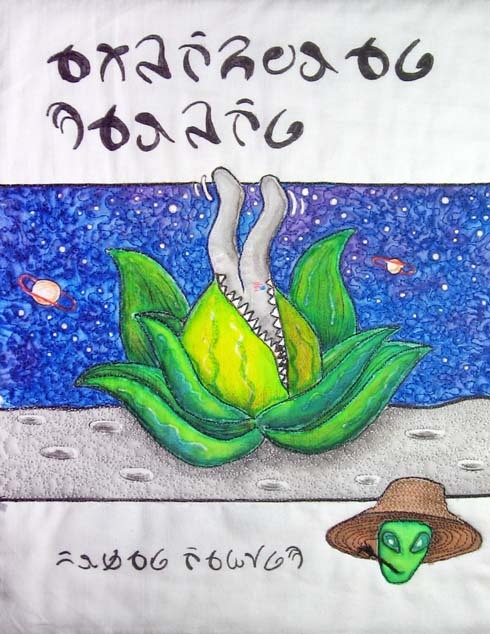 Alien Seed Packets is the result of wondering what kinds of seeds or plants an alien might want to grow. After deep reflection, it became obvious: a top priority for aliens must be growing carnivorous plants to eat astronauts from Earth. After all, aliens surely don't need humans polluting and junking up their planets. The extraordinarily observant may note a tiny American flag on the astronaut's left thigh. The typeface used on the seed packet is called Seltorian. In English, the packet says "Aldeboran Garden Supply" and "Human eating".